Adrift on a boat in the middle of the North Pacific Ocean, the most astounding sight is the utter absence of anything to see. The glassy calm water is undisturbed and gently undulating for miles in every direction. Even if you peer over the edge of the deck into the crystalline blue water, the light of the sun penetrates to a depth of around 600 feet without anything to block its path. There appears to be nothing to see but water here, but looks can be deceiving. It's the impossibly small organisms and their disproportionately large impact on the ecosystem who lured me and a team of scientists to brave the high seas, a curious shark, and an impending hurricane. We came to the middle of the ocean to tap into the secret lives of the microbes that call the open ocean home. We recently published our results in The ISME Journal. In the summer of 2015, a team from Columbia's Lamont-Doherty Earth Observatory–Sonya Dyhrman, Sheean Haley, and I–packed up the contents of our laboratory and shipped it to the other side of the planet. We followed close behind, thankfully with less baggage, and joined approximately 60 biological oceanographers from around the world in Honolulu, Hawaii. From there, we were destined for the North Pacific Subtropical Gyre aboard a fleet of two research vessels. Our expedition was funded by the Simons Foundation and called the Simons Collaboration on Ocean Processes and Ecology, or SCOPE. The mission of SCOPE is to measure and model how marine microbes interact with and influence each other and the environment at large. These processes take place hundreds of miles away from dry land, but they have critical importance for all life on earth. After all, microscopic marine plants, or phytoplankton, are responsible for roughly half of the planet's primary productivity. This means that for every other breath you take, you can thank a phytoplankton. My own research focuses on a phytoplankton called Trichodesmium. It's a keystone species out in the subtropical open ocean. In low nutrient, almost desert-like conditions, Trichodesmium is an oasis. It's a photosynthetic bacterium, so it can use little more than sunlight and carbon dioxide to make its own sugar for food. It's also a nitrogen fixer. Just like the bacteria that live in the roots of the leguminous plants like peas, Trichodesmium can take inert N2 gas from the atmosphere and turn it into a form that supports life. In a harsh environment where other organisms barely eke out a living on the low supply of bio-available nitrogen, Trichodesmium is a floating fertilizer factory. For this reason, it forms hotspots of biological activity—constellations of floating microbial cities that enable global biogeochemical cycles to keep on churning. Comparing Trichodesmium to a city isn't much of a stretch. The cells are large—for a bacterium that is. They're around 20 micrometers wide, nearly 8 times the length of a typical bacterium. These cells form long chains, and those chains clump together to form puffball-like colonies that look like pea green bales of hay the size of a pinhead. If you were to zoom in on one of those puffballs, you'd find that Trichodesmium isn't alone. Other microbes capitalize on the sugar from photosynthesis and bio-available nitrogen that leaks out of Trichodesmium, and make their permanent homes on these colonies. In the world of microorganisms, Trichodesmium colonies are like Manhattan during restaurant week. In effect, Trichodesmium is a microbe with its own microbiome. Trichodesmium was first described by explorer Captain Cook during an expedition to the Red Sea in the late 1700s. It wasn't until the 1980s, however, that scientists stuck Trichodesmium puffs under a high-powered microscope and discovered the colonies were teeming with other bacteria. Exploring this fascinating insight fell into the shadow of another important discovery: that estimates of Trichodesmium's N2-fixing capabilities were low-balled by an order of magnitude. New estimations suggested that even though this organism isn't numerically abundant in the ocean, it still contributes almost half of the total bio-available marine nitrogen. Today, "microbiome" is a buzzword in both scientific research and beyond the benchtops of microbiological laboratories. The discovery that the microorganisms who live in and on us are critically important for controlling how we digest our food, ward off harmful pathogens, and even what we think about has fundamentally altered how humans view their relationship with these minute critters. Bacteria aren't just germs anymore. If a healthy composition of gut bacteria in a human can be the key to a healthy lifestyle, then could the microbiome that lives on Trichodesmium play a previously overlooked role in its ecology? The bacteria in the Trichodesmium microbiome might just hitch a ride through the waves as passive stowaways, or they might interact with their host in some important way. Could they somehow enable Trichodesmium's success and its ability to photosynthesize and fix nitrogen? The SCOPE expedition was our chance to find out. 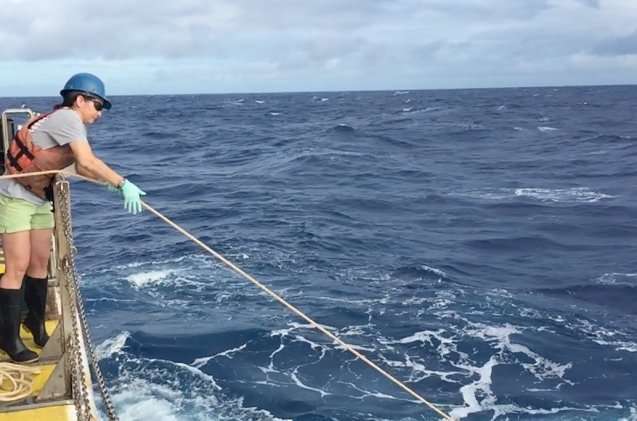 All 60 scientists worked in concert across two ships to take samples for a suite of biological and chemical measurements every four hours for two consecutive four -day periods. As the sun began to peek up over the horizon on the first morning of sampling, Sheean and I stood at the very end of the ship, waiting for the "all clear" from the captain to jettison our Trichodesmium sampling equipment. This gear was like an aquatic butterfly net that we dragged through the water, its fine mesh concentrating the Trichodesmium colonies from thousands of liters of water. The water looked calm, but it was a mighty bicep workout to keep hold of the rope and resist getting yanked overboard. The feat was made even more death-defying when a curious shark started investigating our net. Back on deck, we rushed the sample to the lab and plucked out every Trichodesmium colony we could find with eye droppers. (Nothing tests one's sea legs quite like fishing for bacteria on a moving ship.) 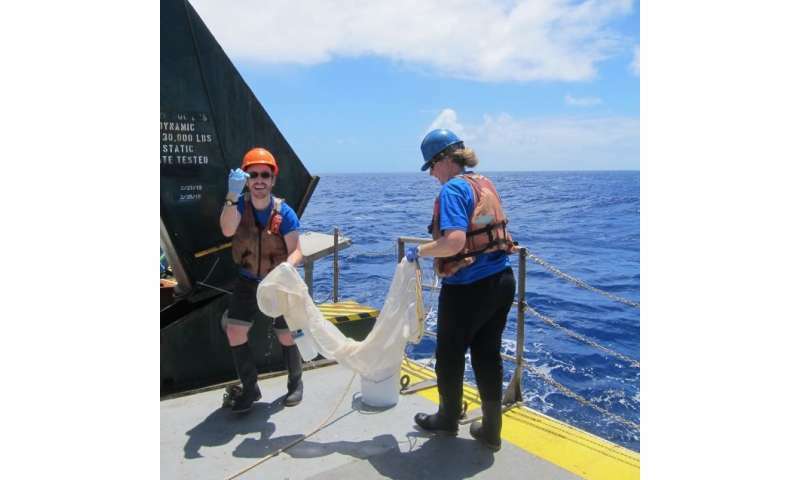 Moving rapidly was key to preserve the integrity of the samples: in order to figure out what the Trichodesmium and their microbiome were doing in the water, we sequenced and analyzed all of the genes that they were turning on and off over our weeks at sea. An organism's genome is like a cookbook—it contains all of the instructions an organism needs to function. The genes are like the individual recipe cards that are pulled out to suit a given condition. Just as winter signals recipes for roast turkey and pumpkin pie, the rising sun triggers Trichodesmium's genes for photosynthesis and nitrogen fixation to turn on. If we could track the expression of those genes throughout the day, and find genes with similar day-night patterns in the microbiome—organisms that shouldn't respond to sunlight—then we'd have genetic evidence of potential interactions between host and microbiome. After a long day of taking samples, Sheean, Sonya and I had hit our stride. But when the sun set we faced a new challenge: isolating the colonies in near darkness. To preserve the gene signatures caused by the rising and setting sun, at night we swapped out all the light bulbs in our ship's lab with red lights. It felt like we were in a submarine. After 96 hours, we had logged many samples, but little sleep. The seas had started to roil as a storm surged towards our ship. In my vaguely seasick delirium, it seemed crazy that I might turn tiny bacterial colonies plucked out of the middle of the ocean into biologically insightful data. Months later, back on dry land at the Lamont-Doherty Earth Observatory, my Trichodesmium gene expression data was sequenced and ready to be analyzed. The signals from Trichodesmium popped out first: beautiful sinusoidal waves showing genes for photosynthesis and nitrogen fixation dancing across my computer screen in concert with the rising and falling of the sun. Then I turned my attention to the genes of the microbiome. There was no reason to believe these bacteria should choreograph their physiology with Trichodesmium. After all, they could just be passive stowaways. I held my breath as I clicked through the analyses and plotted up the results. As the Trichodesmium nitrogen fixation genes turned on and off, genes for nitrogen use in the microbiome followed in lockstep. The same patterns appeared in Trichodesmium carbon fixation genes and microbiome carbon consumption genes. On the other hand, we also found evidence that the microbiome earns their keep on colonies by using up the oxygen produced by photosynthesis, and breaking down the sugars back into carbon dioxide—essentially breathing, eating, and exhaling just like animals do. By removing oxygen, which inhibits nitrogen fixation, and resupplying carbon dioxide, the microbiome ensures a favorable setting for Trichodesmium to continue fixing nitrogen and photosynthesizing. To us, these links suggested a tight symbiotic relationship that could have a profound geochemical impact. Not long after we raised a toast celebrating the published paper, our conversation returned to the sea, to the crystalline blue ocean gyres and all the experiments we want to do next. These biological interactions take place on a microscopic scale–they don't give up their secrets easily, but we're willing to risk the storms, seasickness, and the occasional shark to investigate the tiniest organisms and their big impact on Earth.